Our members can enjoy a true foodie break, with antipasti on arrival, a glass of fizz, dinner and a picnic during your stay and more! In Bury the past is ever present. A centre of pilgrimage for centuries, its history-rich features include an atmospheric ruined abbey, handsome Georgian architecture and tranquil gardens. The chance to visit two breweries proves pretty tempting too. The event that put Bury on the map was the burial, in 903, of St Edmund, the last Saxon king of East Anglia, He’d become a martyr after been decapitated by the Danes in 869 – his grave became a site of pilgrimage and part of one of Europe's most powerful medieval monasteries. In 1214 the English barons came to the abbey to draw up the petition that formed the basis of the Magna Carta, setting the country on the road to a constitutional government. 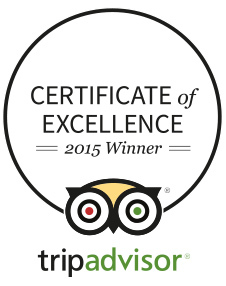 Enjoy prestigious shopping, an award winning market and a variety of attactions! Every year the Bury Festival (20-29 May) provides an opportunity to enjoy a wide range of music and other art-forms over ten packed days of entertainment in venues and spaces all around the town. See artists of international renown alongside home-grown talent. 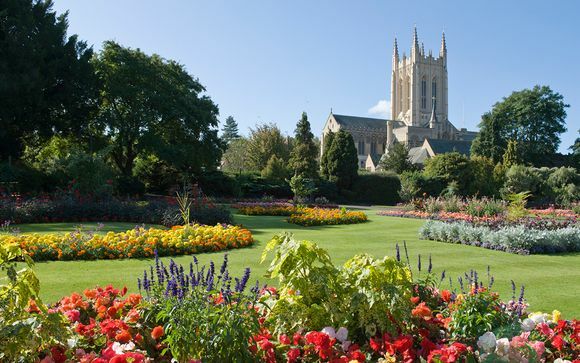 Admire fantastic floral displays around the town with Bury in Bloom - a local campaign dedicated to promoting a greener, cleaner and more beautiful Bury St Edmunds. 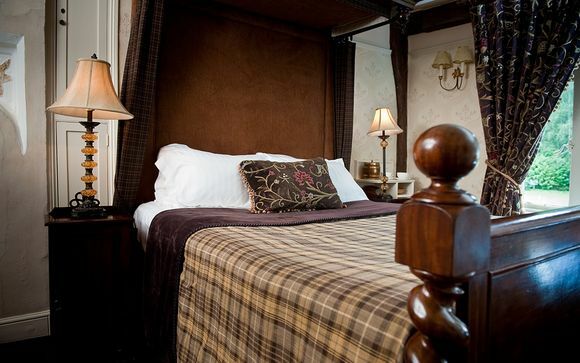 Steeped in history with origins in the reign of Henry VIII, Ravenwood Hall Hotel is one of Suffolk’s best kept secrets. Set within 7 acres of secluded and tranquil Suffolk countryside just outside Bury St. Edmunds. Ravenwood Hall hotel, owned by the Jarvis family, has been restored over the years but retains an ornate carved oak structure, Inglenook fireplaces and rare 15th century wall paintings. All this making Ravenwood Hall one of best hotels in Bury St Edmunds in Suffolk. Ravenwood Hall Hotel offers the perfect hotel venue for a fairytale wedding, a peaceful break, a celebration and delicious dining all year round, with roaring log fires surrounded by an eclectic mix of comfy sofas and chairs throughout for the chilly days or a pool side retreat during the Summer. Each of the fourteen rooms are individually decorated and furnished in-keeping with the historic surroundings, finished with interesting little touches and complete with a beautiful bathroom. Every room offers comfort and relaxation, there are seven rooms in the main Hall with the added luxury of fluffy dressing gowns, slippers and specialised toiletries. All rooms are en-suite, have direct dial telephones, a colour television, tea/coffee making facilities. Dining at Ravenwood Hall is relaxed yet inspiring, boasting a two rosette status. The seasonal menus utilise many local ingredients in addition to home smoked meats and fish, all smoked on-site. Described as English with a modern twist, the menus offers unique dishes in addition to some old favourites that everyone enjoys, all served with the Ravenwood touch. The Dining Room offers intimate dining at its best, with a large Inglenook fireplace and original oak beams, it is both romantic and unique, perfect for more formal dining experiences. The bright and airy Garden Room overlooks the wonderful lawns, terrace and swimming pool making it perfect for people watching or just soaking up the surroundings. The cosy bar is perfect for relaxed dining, surrounded by homely comforts such as books, paintings and other interesting artefacts, you can just sit back in the gorgeous leather chairs and enjoy the atmosphere whilst you dine. Ravenwood Hall is easy to find just off the A14 at junction 45. Ravenwood Hall Hotel is centrally located between Norwich, Cambridge, Ipswich and Colchester and just 3 miles from Bury St Edmunds, it is the ideal location for all events and dining with no parking problems!